iPhones 180x More Likely to Be Current Than Androids. Not. I was disappointed to read one of the most disingenuous comparisons between iOS (s aapl) and Android (s goog) version uptake this morning. TechCrunch’s MG Siegler, whom I genuinely enjoy reading, took Android to task, noting that only 0.4 percent of Android handsets run Gingerbread, or Android 2.3; the current version of the operating system. By comparison, 89.73 percent of iOS handsets are on version 4.x, meaning an iPhone is about 180 times more likely than an Android device to be running the most current operating system version. There’s a valid point to be made here, but (pardon the pun) one has to compare apples to apples. What exactly is Siegler comparing? One the iOS side, he’s counting the major version, iOS 4, and all other minor versions, i.e., 4.1, 4.2, etc. … Yet on the Android side, he’s specifically saying that Android 2.3 is the only one that matters. If you have Android 2.1 or 2.2, you’re behind and simply don’t count in Siegler’s world. Simply put: Counting the major and minor versions on one side the equation means you have to count them on the other side too. And what happens when you do that, using the most current Google Android dashboard numbers? You find that 87.4 percent of Android devices are on version 2.x, which is statistically the exact same as the number of iOS handsets on version 4.x. I could give Siegler’s article the benefit of the doubt if he’d never used Gingerbread and assumed it was completely different from Android 2.2, but he reviewed a Nexus S with Gingerbread. He knows the same thing I know because I’m running a custom Gingerbread ROM on my Nexus One: The differences are very subtle and the number of new features are relatively few. Questionable use of statistics aside, there is a valid point to be made here in terms of Android updates as compared to those from Apple for iOS devices. With the exception of the Nexus devices, the carriers, and not Google, shoot over-the-air updates to Android devices. By and large then, carriers control the Android experience, which is very different from how Apple controls the iPhone experience. Google tried to wrest this control from carriers with the Nexus One, but had to give up in order to get carriers to adopt the Android operating system. In return, Android consumers gain a choice of hardware form factors and features not found on the iPhone. Want a portrait or landscape keyboard with physical buttons? You can buy that. Have to have a whopping 4.3-inch screen? There are a few of those available now and plenty more coming this year. These are just two examples, and they’re important to point out because each hardware variance means a potential impact to the software updates; carriers and handset manufacturers have to ensure that Android works with the hardware. Yes, they use the time to put in their own apps and customizations too, but they can’t just take Google’s code and immediately push it out to phones. This situation allows Android handset owners to be considered “second class citizens” in the eyes of the carriers. After all, which do carriers consider a better investment: spending money to upgrade phones they’ve already sold or spending money on new handsets to gain new customers? Sadly, I suspect the latter situation is more prevalent, which is why many Android handsets don’t see up minor version OS upgrades for months, if ever. The T-Mobile myTouch 3G (3.5mm jack and Fender editions) are just now getting Android 2.2, for example, even though the devices hit market in October of 2009. Unfortunately, Android is still a mobile blend of the old-school carrier control combined with a flexible and customizable mobile operating system. And unless Google asserts itself by trying to wrest back control of the platform from the carriers — something I don’t think it can easily do at this point — most Android owners will continue to be at the mercy of the carriers: a totally different situation from the Apple world. Back to the original source for this post: I still completely respect Siegler and he’s probably the most likely competitor I’d love to sit back and have a few beers with over an iOS vs Android conversation. (MG: the first round is on me.) But based on his choice of statistics for this particular topic, I’m wondering if he and his iPhone are already waiting for me at the bar, clouding judgement on what the definition of “current version” really is. Using the more appropriate rationalization that the minor versions count too, the majority of Android handsets have been current for months. Oh, and just to proactively cut off the expected “fanboi” comments, I’ll disclose that I did dump my iPhone for the Nexus One a year ago. But it’s also worth the mention that I’ve been using my 4th generation iPod touch more and more of late — so much so that I’m thinking of moving back to iPhone this summer and simply using my 7-inch Galaxy Tab for my Android experience. It may depend on Apple boosting the screen size of the iPhone, simply because I prefer a larger display on my smartphone. I do agree on the fact that there is a need to stop releasing updates so often. I stopped reading techcrunch.com because of this Seigler fellow. His articles have made very little sense in general, and TC seems to give him a lot of importance for some reason. His arguments are more emotional than logical. And for me that isnt good as far as journalism is concerned. You’re saying it’s the fault of the developers that middle-men care more about units sold than support. For those wanting Android/Google to stop releasing updates so often, I say get with the times. Just because you purchased a mobile a month ago, does not mean the mobile company should stop everything until “you” are ready to accept the fact that your mobile is outdated and a new one being released, or an OS update is being sent OTA before you climb out from under your rock. If you are not ready for a new mobile OS, then buy a Windows Mobile, then you can count on having the same OS for at least 3+ years. 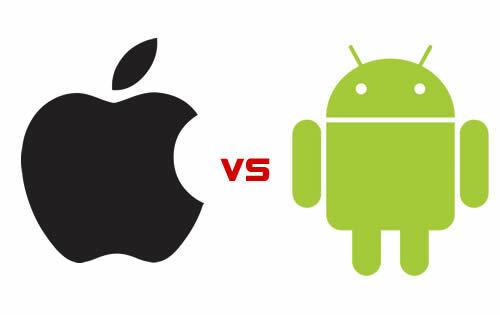 This endless Android vs. iOS debate is unbelievably boring. It is nothing else but a repeat of Windows vs. Apple of years ago, without any added value, and using the same arguments. Could you and the other tech writers please, please report on something of relevance? Pretty please! One note – for most Android phones, it’s the phone manufacturer, not the carrier that controls the upgrade path, since nearly all the major manufacturers put their own skin on top of the base OS, and that skin has to go through the upgrade paces…then once (if) that work is done, the carriers have to test the updates so they don’t push out something to their customers that will brick the phones. Sorry Kevin, but you’re both wrong. The issue that makes this comparison hard is that Apple and Google don’t use version numbers in the same way. At Apple, the .x revisions typically are refinements to the major release. That’s a fairly traditional versioning scheme. At Google, the picture is more muddled. 2.1 was a refinement on 2.0… but 2.2 was a fairly major release, trumpted at I/O and one of the reasons the tech universe was so taken with Android at that point. 2.3 seems, again, more like a refinement release. In other words, the versioning scheme doesn’t seem consistent. The way I’d compare numbers is to use Apple’s .x revisions as one large bucket for the major release (so 4.0, 4.1, etc are all 4.x) and on the Android side I’d put 1.x in one bucket, 2.0-2.1x in another bucket and 2.2x and 2.3 in a third bucket. That maintains a differentiation between 2.0-2.1 and 2.2 and beyond that, I think, is an important one but it doesn’t treat 2.3 as a major release. Rick, I completely agree with you when you say “The issue that makes this comparison hard is that Apple and Google donâ€™t use version numbers in the same way.” And the biggest jump in Android minor versions likely was 2.1 -> 2.2 IMO as well. Good point! So, in other words, you agree that your entire line of reasoning was flawed, because comparing iOS 4.x versions to Android 2.x versions is not the straightforward comparison that you’ve implied and based solely on the fact that they were all point releases, thus, according to your original article, equivalent. Perhaps we could get more honest, or at least informed, writing in the future. So, in other words, you’d rather just criticize the logic of other’s opinions rather than put forth your own opinion. Got it. ;) All joking aside, how about adding something to the conversation, i.e. : what’s your stance on the Android uptake rate, what’s considered “up to date” and how can Google address the issue? That’s far more important to me (and everyone else, frankly) than how either I or MG interpret the actual data. Presumably for the comedy factor. This entire article is an exercise in sophistry. It’s entirely valid to compare 4.x against Android point releases since the differences between them are much greater than the difference between, for example, iOS 4.0 and iOS 4.1. Another commenter said it best, “You did an excellent job of defending the Android platform!” Unfortunately, you didn’t do a good job of evaluating the facts in an unbiased manner. Like the author, I too abandoned the iPhone for a Nexus One. I’ve kept it stock and relied upon the Google OS updates rather than rooting and using custom ROMs. The comparison of iOS and Android installed versions seems a little silly to me. However, I have noticed a real difference in how Apple and Google handle updates. With iPhone, Apple announces an update and releases it on a specific date. At that point, everyone with a qualifying device can update. Google announces an update and then we wait some indeterminate time for it to be released. When it is released, it is only available for certain devices on certain carriers with no apparent logic (from the customer’s perspective). For example, Google announced Gingerbread weeks ago, but we are still waiting for it to appear as an (official) update. I think it is the management of customer expectations that distinguishes Apple and Google on this. From my experience, I think Apple does a better job of this. i wouldnt take MG’s article too seriously. everybody just needs to be prepared that as Android continues to overtake iOS in marketshare these big name AppleFan bloggers are going to try more & more tactics in order to discount the platform hoping to slow the momentum. just as painful as it was for the Apple faithful to watch Windows overtake it in marketshare it’s going to be far more painful this time around as Apple had a legit shot to rule the world but once again SJ’s lack of flexible vision ruined it, this will be his ultimate legacy. i have a friend who used to be a huge Windows fan & he just recently started buying Apple products mainly to dev on. he is now reciting to me all the Apple propaganda constantly, it’s like he no longer thinks for himself, reminds me much of a Republican. once he realizes that there is little to no profitability to be made as an Indi dev in the app store (any app store) i assume he will come back down to reality. it’s just tech people, none of these companies “care” about us. we serve only as a mean to make them rich. “that as Android continues to overtake iOS in marketshare” – That will be tested when Verizon ships iPhones – Until then, there hasn’t really been competition here in the U.S. – That’s going to be interesting to watch and until then the U.S. stats are foggy at best. I am sure the same logic applies for iPad sale figures and projections? Cause Verizon is going to put a little dent in US market for Android phones, but the Honeycomb tablets are going to drill holes in iPad sales all over the world! @alchemist007 — Same logic doesn’t “yet” apply — Until there are actual honeycomb-based devices on the market for sale with a “price tag”, one can’t even speculate. And, honeycomb won’t be going against iPad1 but the iPad2. So, it’s a double whammy because we don’t know what that will feature or what Apple will do with the pricing either. You did an excellent job of defending the Android platform! First and foremost, I love technology and love smartphones. I have been enjoying my HTC Incredible for the last 9 months and could never envision ever using an iPhone. For the basic user, the iphone offers basic functionality, but for an advanced user the iPhone is too basic. For me, rooting and customization is the reason I will stick with Android. This weekend alone I have flashed 6 different ROMS- why you may ask? Because I can and enjoy seeing other custom ROM’s functionality. So Kevin, why would want to downgrade and use so such a basic interface and sacrifice true customization and did I mention real multitasking?? Oh well, I stick with Android and hope to chat with you in a year about your ios experience. Android FTW!! “for an advanced user the iPhone is too basic – huh? Know a lot of very geeky (advanced users that love their iPhones – The ecosystem is just so large that there’s some really great stuff in vertical markets that android just doesn’t have and probably won’t for quite some time. “rooting and customization is the reason I will stick with Android” – huh? – Evidently you’re not aware that iPhone can be rooted also. Most (even advanced users) don’t want to spend the time flashing 6 different ROMs. They just want to get stuff done fluidly, easily. Yeah, have fun in that walled garden of ios. Are those advanced tasks like changing the wallpaper and categories?? wow- so advanced. Finally, itunes is a turd, but I’m sure you know that already!! Ahhh, another condescending open/android advocate. You’re everywhere. How’s that Antenna-gate treating you? Oh, you’re not supposed to use the phone with your left hand remember? Enjoy! @Migeeman – Not a problem at all. On the other hand I have but 1 bar 1RT on Verizon at the moment. Bring your droid here and we’ll have a little face-off. MG is actually correct in comparing 4.x to 2.1, 2.2 and 2.3 minor versions. Look at it from the user perspective. I am on 2.2 and am dying to get 2.3. But, I can’t! So 2.3 matters and I am not happy to be just on 2.x! Why are you dying to get 2.3? Just to have it? ;) I’ve been using it for about 10 days on my Nexus One and it really doesn’t make the phone that much better just yet. There are new features and APIs that developers can take advantage of but given that so few phones can leverage apps using them, the majority of apps are still the same. From a user perspective, what major features or functions are you currently missing? And what about folks on iPhone 3G or 3GS devices that have some missing features from their OS? What about folks that haven’t upgraded their iPhones to the latest version of iOS? Yes, they can do that, but it doesn’t mean they have. From a user perspective, they’re behind and may not even know it. I’m not saying there isn’t a versioning problem, in fact, I addressed this real issue in the post. But the comparisons MG used simply aren’t logical in my opinion. The biggest improvements in Gingerbread are the new keyboard with its correction enhancements, and the new text selector. The text selector itself is worth upgrading for. No argument, Randy. Instead of a third-party keyboard, I’ve been using the native one in Gingerbread due to the improvements. FWIW, folks that want to try the new keyboard can search Google for the .apk and install it – it was floating around the web around the first week of December. While TechCrunch article is baseless, I agree more with your view on the subject but I strongly believe that the truth is somewhere in between. The issue is not as simple as .x release! What works on 2.3 (ex, Internet calling) doesn’t work on others and what works on 2.2 (Flash) doesn’t work on rest of the platform, even 2.1 and 2.1 update 1 has major differences (pinch to zoom) Also, the fact that OTA updates, when available, aren’t even in tune with each other for different manufacturers and carriers. I am becoming a die hard Android fan, but it kills me to see all these incompatibility issues blowing up one day soon and slowing down the platform growth. I have faith in Google and really looking forward for this Google I/O!! Thanks for pointing that out. Had expected that someone would have added some sense into this. Obviously the Android fans don’t understand that major.minor are not necessarily equivalent across products. Look at Apple’s own OS X 10.x It has stayed at 10 since it came out. You can’t compare iOS versions which apear every 12 months, to Android versions that appear every few months. Google’s major versions (1.0, 2.0, 3.0) have also arrived every 12 months or so. But Google CAN be blamed for these minor updates. Gingerbread was supposed to have Honeycomb’s features, but that was delayed so they have to split them off, and pack a few features for Gingerbread to be worthy of an update until Honeycomb is ready. We’re going to have Honeycomb in March, and then at least one other version at Google I/O in May or June. That would be a version every 3 months or so. Google has to stop this! Carriers and manufacturers can’t keep up with all these updates, and even if they can they’ll only do it for maybe one or two of their most popular models, not most or all. Google needs to slow down the updates so manufacturers and carriers can roll out the major versions for most of their phones throughout the next 12 months, until the next major version shows up. Andy Rubin promised they’ll slow down their updates, and I hope that once they unify their Android versions (Honeycomb for phones) at Google I/O this year, they’ll start a 12 months upgrade cycle after that. Users will also benefit from this because then they’ll be able to focus more on choosing the hardware, rather than deciding whether they want a more powerful phone with an old OS version, or a weaker phone with a newer version (kind of like Nexus S vs Motorola Atrix). Plus, Google would also update their core apps throughout the year, independent of the OS version. I completely agree with you. I have heard in one these blogs that someone from Google or Android team were quoted as saying “Don’t miss this Google I/O” and back then I thought it was Honeycomb. Now that Honeycomb is out of the way I am hoping more structure to Android is about to arrive! One only can hope! You are correct that the other article is comparing apples to oranges. How could someone compare 4.x to 2.3??? Why not compare 4.x to 2.x which makes more sense? Every couple of months, I’ll decide to throw TechCrunch in my RSS reader to see if I want to read it. Thus far, it has never lasted more than a day before it gets deleted again. I visit the site from time to time, and I pretty much have the same experience. Despite all the praise Kevin gives to Mr Siegler in this article, I think Siegler is the biggest problem with the site. He clearly has a chip on his shoulder. It seems like all of his articles are meant as a challenge to the people commenting on them. Not an invitation to debate, but a pure flame bait. He has picked sides, and in his mind, so has everyone else.